Extracting insights quickly from Big Data sources like Hadoop or MongoDB yields tremendous competitive advantage for companies. Today, the three most popular approaches to connect to Big Data environments for business intelligence reporting are Interactive Exploration, Direct Batch Reporting and Batch ETL into other databases. Interactive Exploration minimizes latency via native connections to Big Data environments, enabling companies to gain insights into their Big Data, ten times faster than with traditional SQL-like Big Data access methods. 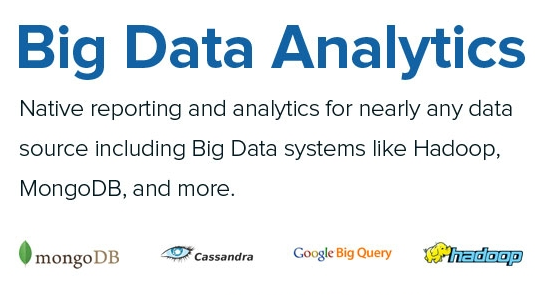 The Jaspersoft Big Data Connectors provide native connectivity for iReport, JasperReports, and JasperReports Server to Hadoop and NoSQL Data Sources. These connectors provide the Jaspersoft users with the tools necessary to not only manage their Big Data Analysis needs using Batch ETL, but to conduct direct, interactive exploration and direct batch reporting against the Hadoop and NoSQL data sources.